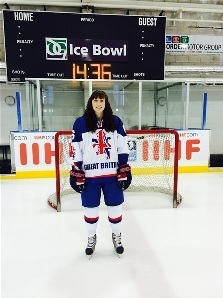 ISLE of Wight ice hockey talent Sophie Herbert will be wearing the national shirt with pride at this year’s world championships in Slovenia following her selection for the Great Britain team. The 24 year old forward from Ryde, who plays for the Bracknell Queen Bees, went through a long selection process up and down the country to make the 22-strong GB squad for the Ice Hockey Women’s World Championships in Maribor, Slovenia, announced last week. She said: “I was over the moon to hear I had made the team. This year’s trials were extremely competitive and it was great to be on the ice with such good talent. “I couldn’t be more excited to travel to Slovenia and compete in the championships. It is always a great honour to put on a GB shirt and to represent the country. “This year has been an incredibly tough year for me to train and prepare for it. Unfortunately, our home rink in Ryde has been closed and has been completely unused since October 2016. “This has had a detrimental effect on not only myself, but for all the Island’s skaters. It has been tough having no way to train on ice, yet I have so much passion and desire to bring home a gold medal for my country. Sophie, part of the Isle of Wight Council’s talented athlete programme, grew up skating and playing ice hockey at Ryde. “Ice hockey has always been a huge part of my life. I have been fortunate enough to travel the world with this sport, played for ten different hockey teams and taken part in four world championships, winning a bronze medal and two silvers,” she added. “I owe a lot to this sport and I couldn’t be more grateful to have this opportunity to play for my country. GB, looking to build on their bronze medal in South Korea last year, will compete against countries in the tournament, which starts on March 31.